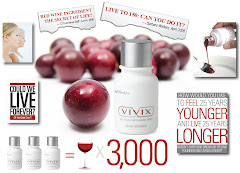 Vivix Shaklee's Resveratrol Anti-Aging Tonic has more testimonies rolling in than Carter has pills. This testimony about Cluster Headaches will make you want to share with anyone that struggles with headaches. CLUSTER HEADACHES: My headaches came out of nowhere. One moment, everything was fine, then, wham, a stabbing, searing pain injected just behind my right temple and in front of my right ear. From the late eighties, these headaches took over mylife. Because of them, I retired from the military. I left positions where I was a plant manager and a financial planner. I stopped coaching and basically stopped doing everything that I loved. I have tried several therapies to win this battle over my cluster headaches. Nothing worked until September, 2008 when I started using Vivix. I have been using Shaklee supplements for several years and have experienced many improvements to my overall health,except the headaches. After about three weeks on Vivix my headaches were gone! It feels like I have my life back. There is a part of me that feels like Rip Van Winkle; I may have been awake for the last twenty years, but it has been a blur. Vivix has given me the ability to focus again. Do you have something in your life that seems to have taken over? Maybe it is headaches, diabetes, cardiac or neurologically driven. It may be a lack of energy or concentration.